The Sony flagship we’ve all been anticipating since the introduction of the X-series is finally here. The Xperia XZ brings further refinements to the 23MP shooter introduced with the Xperia Z5 and its siblings, adding a laser autofocus to phase and contrast detection, and a dedicated sensor to assist with picking the proper white balance. What the Xperia XZ lacks is optical image stabilization – even the iPhone has that box checked this year. Indeed, the iPhone 7 is the first generation small-sized Apple smartphone with OIS – up until now the feature could only be found on the Plus-sized models. That’s not the only upgrade over the iPhone 6s’ cam, though – you get much faster optics (f/1.8 vs. f/2.2), marginally wider FOV (though at 28mm-equiv it’s not particularly wide) and a 4-LED flash. When it comes to ‘wide’ there’s no beating the LG G5 and its 8MP 135-degree FOV wide-angle rear camera. However, that’s quite a specialty tool – for general shooting you have a proper 16MP f/1.8 wide-ish 29mm cam with laser autofocus. The Galaxy S7 takes a different approach to the focusing race and has a phase detection sensor at each pixel – a total of 12 million phase detection agents. Beat that, triple-hybrid Sony! 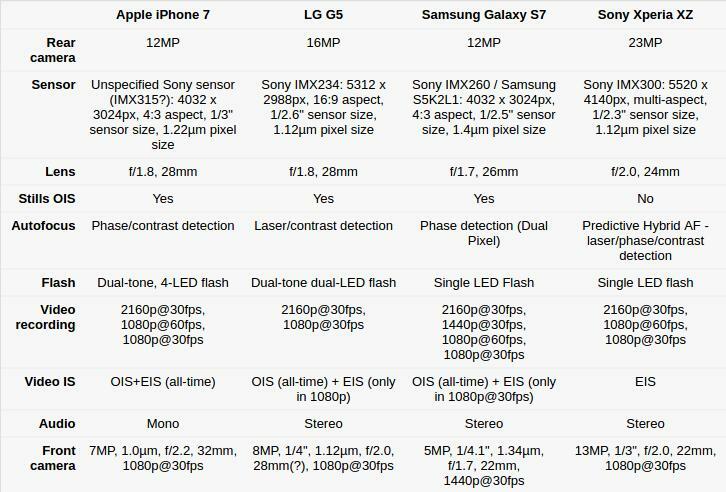 The Galaxy S7 also boasts the widest aperture of the bunch, though the difference between f/1.7 and the f/1.8 of the others is marginal.